I just love social media! One of my Twitter and blog followers sent me this photo,which is great, as being a non-driver and bogged down in studies I don’t get to all four corners of our town. What you are looking at is a new(ish) piece of public art that is also a handy bench: a perfect marriage of form and function indeed! But not just any old bench. This here is a Portrait Bench. So now, not only do I know about this lovely bench, I also know about the concept of portrait benches and a little bit more about Swindon’s history. And it started with a Tweet! The three figures you see here are representatives of some aspects of Swindon’s rich heritage. 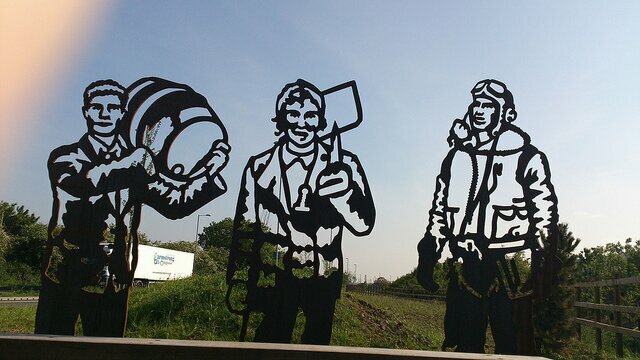 The chap with a barrel on his shoulder is representing Arkell’s Brewery, established in 1843 and still going strong. The man in the centre serves as a homage to Swindon’s rich railway heritage, glimpses of which you can see in a couple of my other posts, A Tiny Tour around the town and the one on the Outlet Centre. The third figure, as you can no doubt tell is a WWII airman, in tribute to the part that Swindon played in producing the Spitfire – arguably the nation’s most famous aircraft. The factory that contributed to the Spitfire production was located in South Marston, hence the fitting inclusion of an airman on this portrait bench. If you want to know more about all of that then Swindon Web have a fab article about it all and read here to learn more about the figures used in this particular portrait bench. Isn’t it a really neat idea? Swindon Travel choices have some information on it on their website. Finally why don’t you check out this video about it from Swindon Web TV on the opening of this fabulous Sustrans South Marston cycle path, adding to the great cycling network in and around Swindon. Please consider signing up to follow the blog – that way you will never miss a post. Loving the Blog. Swindon is a lovely Town, which deserves celebrating. Well done and thank you! On the subject of sculpture… Stanton Park was the venue for a 4 day event in Summer, teaching about applied architecture. Very hands on and the result was that there are now 5 timber structures dotted about, all larger than life, and each one unique. Thank yoo so much for your kind comment. And thank you for the heads up about the timber structures at Stanton. I don’t drive so can’t easily get out there but I’m sure I can find someone to come with me. That would be wonderful! I’m in my final term of my English degree so if I could put it on hold till then? That would make a fabulous blog post. Thank you. If you do want to get out there you can take the No7 bus to South Marston (Supermarine stop, the last stop in Swindon so regular bus ticket is fine) then about half mile walk to Stanton’s Gates. Nice day out, done it a few times. Thank you for the heads up there, I will bear that in mind. However, I have a friend who I’m sure would love to come with me. And I really can’t think about it just yet. But def would love to do so. It sounds great! I’ll add the link to your page into the blog post. Dear born again Swindonian….love your blog… you have commented on my FB page – or maybe it was “highworth’s missing link” page re my photo of the portrait bench / new sign / 3 sculptures.. As much as I LOVE it….. I alway wonder….. WHY this specific location — DIRECTLY IN FRONT of a LORRY LAY BY — was chosen. As a utility cyclist who uses this path every Saturday to get from highworth to Swindon, I’ve seen bags of (lorry drivers’??) rubbish, ripped open, I assume by birds or animals. To sit on the bench while lorries are parked there is a bit daunting if there are 3 or 4 lorry drivers; to be cut off from public view by huge lorries… at least for young people….. and one particular time I was on my way back home to Highworth, dreading that last leg of the journey, which that day was going to be the dreaded A361….and as I slowed down to sit on the bench, have a sip of water and the other half of my energy bar, I happened upon a lorry driver relieving himself against one of his tyres. I am not easily shocked, but lost any urge to sit on the nearby bench……. did not B & Q or Sustrans think of this? A shame the portrait bench wasn’t positioned before or after the lorry layby. do you think I’m alone in thinking this? I’m not going public, it’s done now, and I love it. Just a shame it is hidden by lorries,… and just a tad bit ironic if you think about sustainable travel and the wonderful sky blue paint job of the B&Q warehouse….then….LORRIES …!!! Ok, just had to vent a bit. That was therapeutic. 🙂 Love your blog!! Yep – well I can see your point but you’d have to ask Sustrans about that I fear. I would love to know more about the Highworth’s Missing Link thing. Would you or anyone care to write a guest post about it?